When it comes to abusive relationships, it isn’t always just physical abuse. While this isn’t meant to detract from the issue of domestic abuse that far too many men/women have suffered (and still suffer), it’s to address the fact that emotional abuse can be just as damaging, but in completely different ways. When you’re in an emotionally abusive relationship, it’s not always noticeable right away. You don’t bear the bruises of a physical attack, but you’re still scarred in many ways, and that scarring leaves an imprint that can affect every future relationship. It’s hard to love again after you’ve been manipulated, put down, controlled, belittled, and made to feel worthless by someone who was supposed to love you and care about you. 1. We keep our distance longer than most. Even if we think we’re really into you, we’re going to keep our distance. We’ll keep you at arm’s length, might not text you back immediately, and definitely won’t want to spend too much time with you. We just don’t want to get too close. 2. We play it close to the chest. After you’ve been emotionally abused, being able to open up freely is painful. We don’t want to put ourselves in a vulnerable situation again and when you open up about yourself, that’s exactly what you’re doing. You’re exposing the bits and pieces of you that all of a sudden make you a target. For us, it’s safer if we just keep some things to ourselves. 3. We take it slow. I don’t mean just physically slow, but emotionally and mentally slow. Like a wounded puppy, it’s hard not to proceed with caution. It’s just an instinctual way of protecting ourselves from further harm. When you’ve been with someone who’s put you down over and over — saying you’re no good and are worthless — you just can’t help but wonder why anyone would want to be into you ever again. 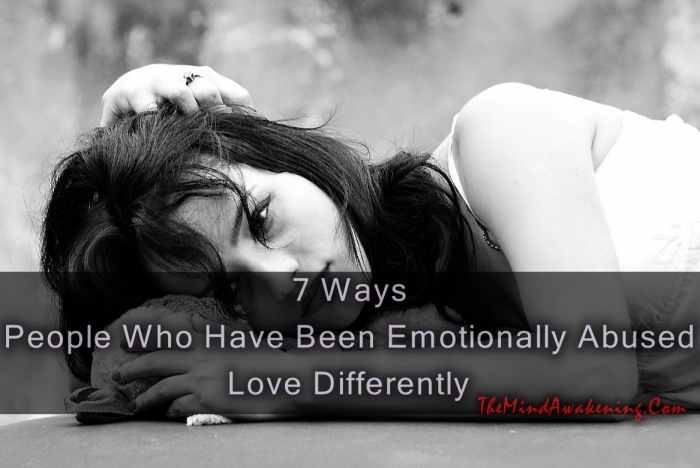 If you tell us you love us and we look at you weird, it’s not that the feeling isn’t mutual; rather, we’re still a bit unclear as to what about us might be appealing or lovable to someone else. 5. We’re hesitant about getting to know the people in your life. When you start to get to know the friends and family of the person you’re in a relationship with, it means things are getting serious. It also means that your lives are becoming more and more intertwined. It can feel a bit scary, so we proceed with caution. 6. We’re affectionate, but on our own terms. When I first met my husband, he was baffled by how little affection I gave him. Even at the height of our love, I had to be affectionate on my own terms. If he cuddled up to me, sometimes I’d pull away. It wasn’t that I didn’t want to be close to him, but after the relationship before where affection was so minimal, it took me a long time to learn how to cuddle again and to enjoy it. 7. We assume the worst (but hope for the best). When you’ve been mistreated by someone you love, you automatically build up a wall around your heart. You become guarded, protective, and you hand out your love in pieces, bit by bit. Because this is the case, we naturally assume that things won’t last or that we’ll be hurt again. Of course, we hope it won’t be reminiscent of the past, but we do assume the worst longer than most. It’s simply a coping mechanism, and one that works for many of us.